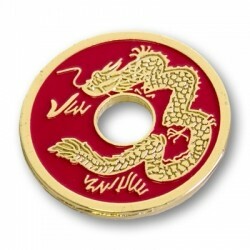 Produktinformationen "China Münze - Rot"
High quality imitation Chinese coins, perfect for all of your routines. Highly-polished finish with raised Chinese characters on one side and an exotic dragon on the other. These are NOT cheaply stamped and painted washers - they’re custom-made coins, crafted with the magician in mind. The same size as a US half dollar, these coins work well for manipulation, matrix routines, Charming Chinese Challenge, Spellbound and Three Fly - nearly any coin effect. Weiterführende Links zu "China Münze - Rot"
Kundenbewertungen für "China Münze - Rot"